Gerta and her family are living in East Berlin during the time of the Cold War. One evening her father and brother go over to the West to make preparations for their family to move to a place where they will be free, when overnight, a wall divides the city, keeping its residents caged in like animals. Gerta, her mother, and brother Fritz are now stuck in East Berlin where they must constantly fight and dodge the Stasi, the East German Secret Police, who have put a mark on their family due to their father's involvement in resistance activities while he was a citizen of the GDR. So the next four years of Gerta's life are spent longing for her father and brother and a life with them in West Berlin. When one day, Gerta spots her father on the other side of the wall sending her what seems to be some sort of message. As she attempts to interpret her father's cryptic dance, a little while later, Gerta receives a mysterious photograph that seems to be telling her that she and her brother need to tunnel under the wall to escape into West Berlin. But after Gerta's brother Fritz faces the death of a friend as the result of a botched escape attempt, the family must consider the real possibility that attempting to dig a tunnel to the West might result in their arrest and possible death. The question is, are they willing to take the risk? I've written about Berlin many times before. But here I go again. Berlin is my favorite city in the entire world. When I visited it for the first time back in 2004, I had never been to a place that had such a youthful energy despite its bleak and storied past. Reminders of that past are on just about every corner you turn, yet the energy of the city still feels vibrant, palpable, and charged with hope. It is the place I realized how little one can actually learn about history inside the walls of a classroom. When my husband and I visited visited the Checkpoint Charlie Museum during that first visit to Berlin, and despite the fact that we have very short attention spans when it comes to visiting museums, we spent over three hours there just soaking in the stories of all the people who tried to escape into the West and marveling at the lengths people went to in order to live in a free society. Ever since that first visit to Berlin, I have been waiting for history to catch up to itself and find more children's literature about the Cold War, more specifically, about those who lived behind the Iron Curtain. In A Night Divided, I have finally found the Berlin Wall novel I've been waiting for. This is a meticulously crafted book. From character to plot development, Nielsen left no detail amiss. And in some ways that is both a strength and a weakness. Because this book is so perfectly and precisely crafted, it almost feels too perfect, with everything in its place just so, when we all know that life doesn't always work that way. I want to make it very clear that I am not saying this to be persnickety or nit-picky, trying to find problems where there are none, but simply noting that as I was reading, I felt like I was constantly aware of Nielsen's craft moves because they were so precise. But that is honestly the only thing I have to criticize about the book. It is page-turning, suspenseful, will fill you with emotion, and reads like an extended version of those heart-wrenching stories you read at the Checkpoint Charlie Museum. 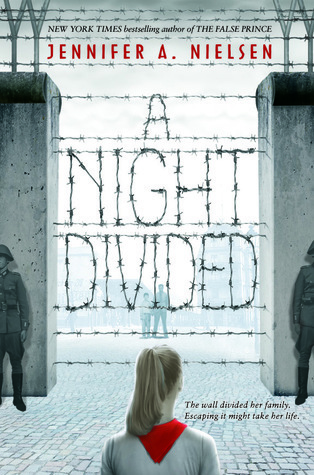 It it is exactly the kind of Cold War middle grade/young adult historical fiction I have been pining for since I first visited Berlin over ten years ago and internalized the words of John F. Kennedy back in 1963 when he stood in the shadow of the Berlin Wall and said, "Ich bin ein Berliner."